Porter Consulting Engineers work in the Sport and Recreation area continues in 2015 with involvement in the development of synthetic turf facilities at both Guildford and Warwick. Our staff has experience in recreational and synthetic turf projects and are familiar with the latest products and standards. Porters has been engaged by the School to assist in the development of concept plans to submit to the relevant local authority for approval. Our involvement also includes design development, detailed design and tender review for the artificial turf on the school grounds. Porters has been engaged as part of the team assembled by Paterson Group Architects to provide specialist consultancy services for a brand new hockey facility at Warwick Open Space. Our involvement includes development of concept plans for artificial turf and grass fields, detailed design, tendering including tender evaluations and contract administration during the turf construction. 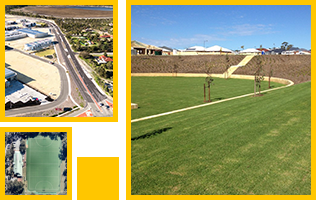 Meetings between the consulting team, Whitford Hockey Club and the City of Joondalup have been held and the project is scheduled for completion in 2017.